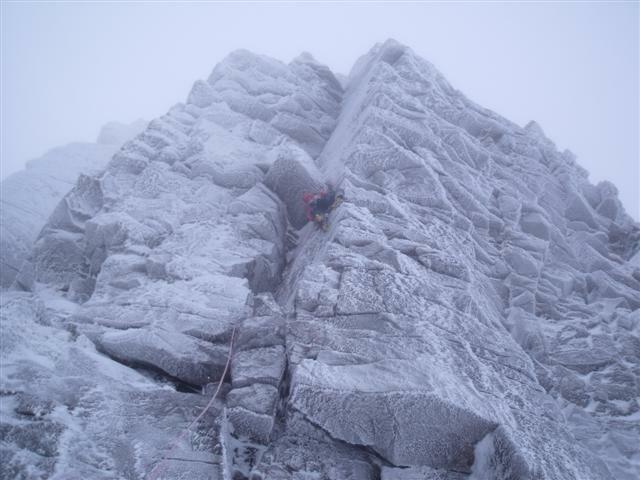 Below: Me leading the easier ground at the start of pitch two. Adam and I went onto the Ben today for the first time this season. 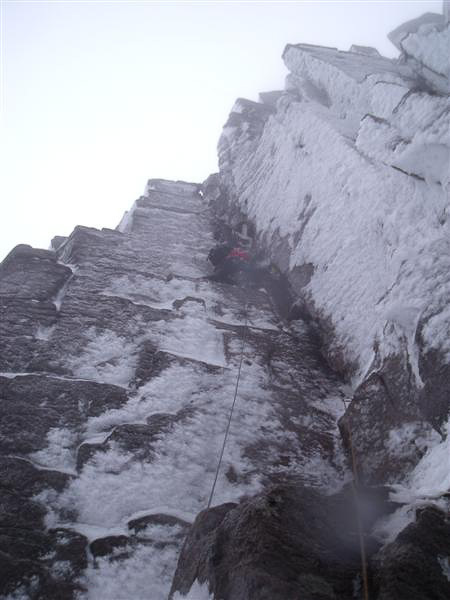 We climbed Smiths route which was in good nic with fairly good ice screw placements, some where a bit (spaced) run out. But the climbing was really worth while. 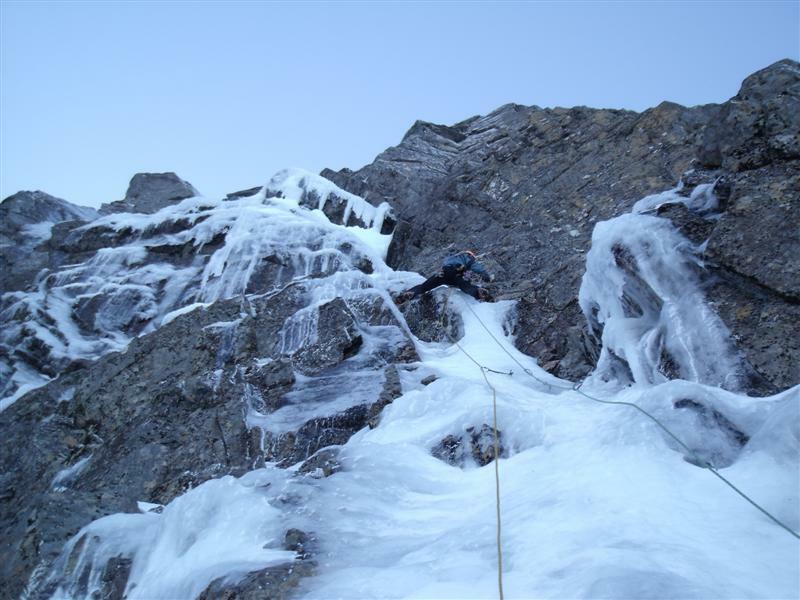 We then went down and did Tower Scoop which was very enjoyable with some really good ice. The weather was amazing with the sun beaming down all day and no wind which is a bonus. I have not climbed alot on the Ben but I had a really good day and im now looking forward to getting out in that area again soon. Hoping to get one last route in before Crimbo, Adam and I headed into a very busy Coire an t’Sneachda yesterday to find most of the buttresses in lean but ok climbing condition. 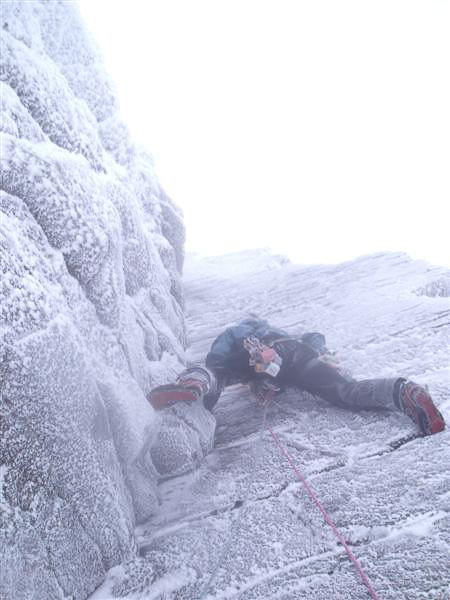 There was snow and ice on all the ledges, the turf was frozen solid and there was a good build up in the cracks. We did Fingers Ridge Direct which had some superb and highly technical climbing with minimal gear but just enough not to be gripped all the time. It was a good day with nice weather, except the wind picked up later in the day but we were finished by the time it got too bad. We were glad to get out as the weather looks like it is not going to get better this side of Christmas. So hopefully we will get out in the not to distant future. Back in Lochain today with James Dunn, conditions were looking good everywhere. We decided to get on Savage Slit which was buried under a good helping of rime; which made gear hard to find and meant lots of clearing. It was a good route with some top class thrutching. Getting out again on Tuesday and hopefully get an equally good route done. Today Adam Hughes, Neil McGeachy, and I did Fallout Corner in Coire an Lochain. All the buttresses where in perfect condition, fully rimed and snow on ledges. 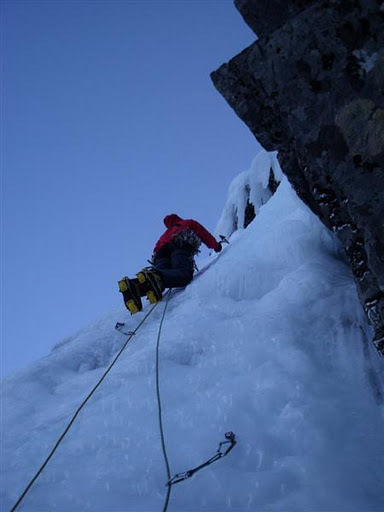 There was quite a lot of ice build up in the cracks which made some of the climbing harder, but nothing too bad. 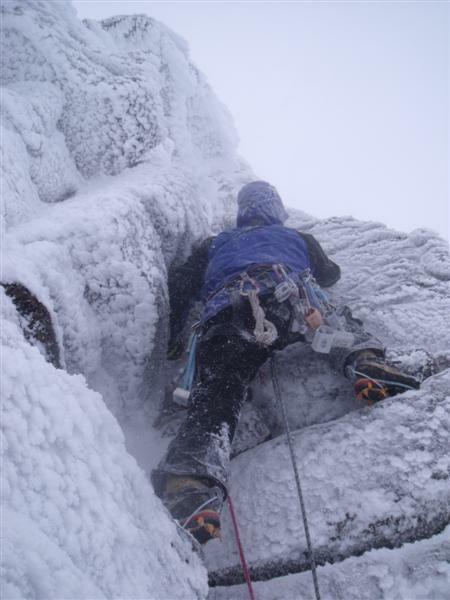 I lead the first pitch up the groove and through the roof, with hard moves around the roof because of ice build up. Adam lead the sustained second pitch with some highly technical crack and slabby climbing, and Neil lead the shorter but very enjoyable last pitch with some thrutchy madness at the top. All in all the weather was ok and the conditions where good, so it was a fun day had by all. Me getting down and dirty on the steep first pitch. Euan after the super powerfull moves on the steep arete at the start of the third pitch. Yesterday Euan and I went into Coire An Lochain and did The Migrant. 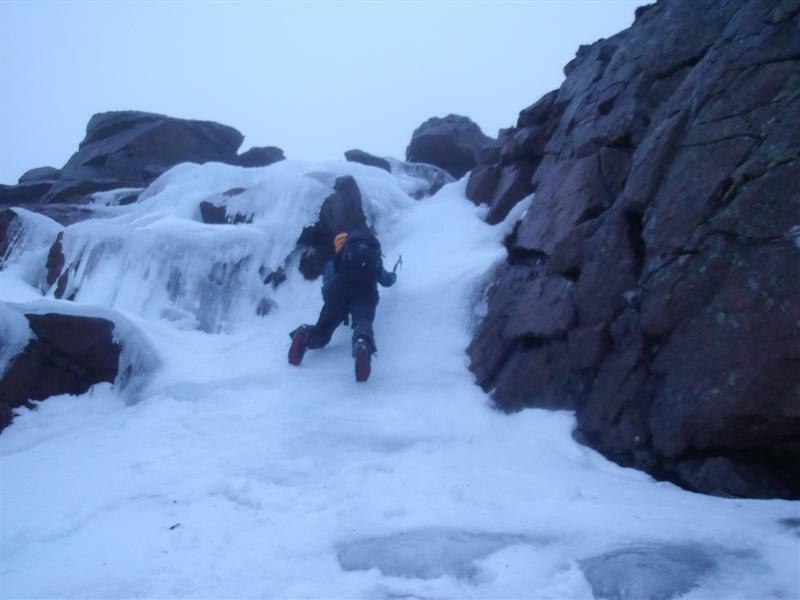 The whole coire was in perfect climbing condition, all the rock was well rimed and the turf was frozen. The route followed an amazing line with a very steep and technical first pitch (crux) and a super powerful third pitch. I lead the first and second pitches which took me the best part of three hours, from fighting my way through hard, technical and pumpy climbing and trying to block out the sickening pain of Hot Aches. Euan then went on to lead the third and forth pitches with the best moves I’ve ever done on a winter route being at the start of the third pitch. 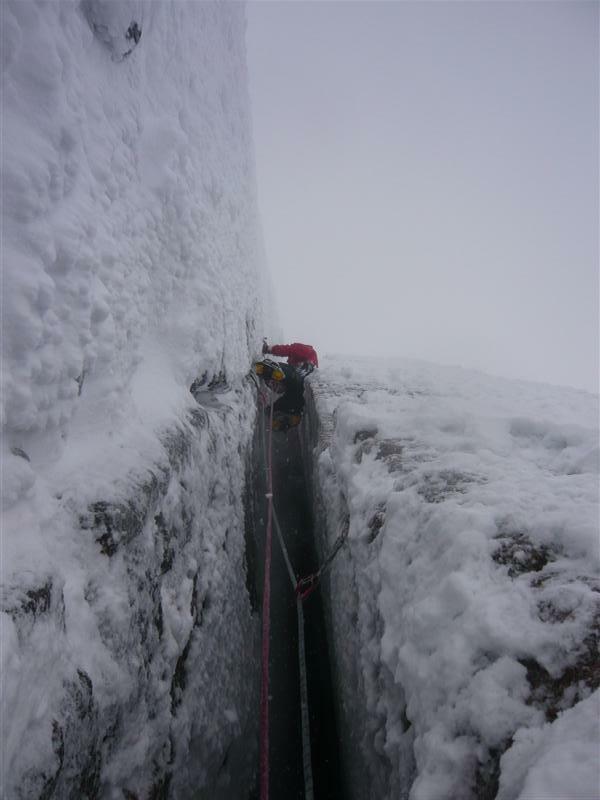 With some yelps of joy from Euan as he disappeared around the arete at the start of the third pitch I knew I was goining to enjoy seconding the powerfull climbing even though I was pretty tired from leading the previous two pitches. The rest of the route was fairly straight forward, apart from a very run out section on the forth pitch on some very minimal torques. But as dark was closing in we topped out on the summit, tired and hungry but psyched to the max from the amazing days climbing we had just had. The wind picked up a bit on the descent but the weather had been so good all day we wern’t that bothered as we made our way back to the car.